What a great weekend! I just got back from the 61st Annual Michigan Watercolor Society Exhibition. It really is a beautiful show which will be at the Ella Sharp Museum in Jackson, Michigan through July 6, 2008. From Jackson 30 of the 70 paintings will be traveling to The Alfred Berkowitz Gallery in Dearborn August 4 - 28; The Art Center Traverse City, September 2 - 26; The Arts and Science Building, October 3 - 31; Saugatuck Center for the Arts, November 7 - December 29; and finally to the Oakland County Galleria, January 9 - February 19. More details will be on my website soon. 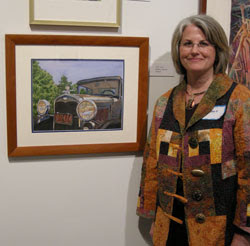 Here I am, at right, with my piece from the show. 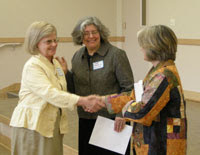 Left, Betty Pruden receives her award from MWCS President Lori Zurvalec, center, and me. Photo at right is of Juror, Ellen Murray, award winner Darcy Scott, and award winner Charmaine Kaptur. If you get a chance to see the show at one of the venues, I guarantee it will be worth your time!